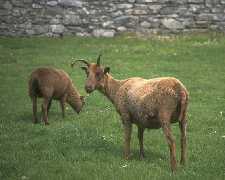 The name is derived from the colour of the fleece - Lugh (mouse) and Dhoan (brown) being very descriptive (an alternative is from Lhost dhoan (Burnt brown) - Name sometimes given as Loaghtyn or Loghtan. As the outer fleece bleaches in the sunlight when woven the cloth has a slightly speckled appearance. The wool is not usually dyed as chemical bleaching would damage it,. It is one of the ancient breeds of sheep, native to Mann; believed to have been on the Island for over 1,000 years - there is no evidence of it having been brought over by the Vikings. 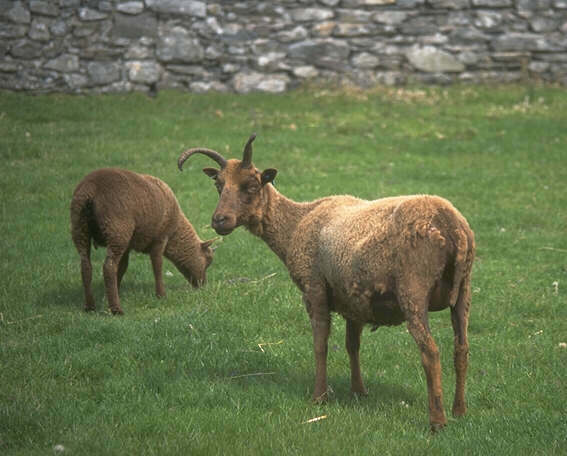 Described as a hardy animal with good mothering instincts - brown down to its feet although lambs are born black this colour starts to change from about 2 weeks old. Multihorned - usually four but sometimes six.